As vice president for research and innovation of the University of Hawaiʻi System, Vassilis Syrmos is charged with providing critical leadership and coordination of systemwide research and innovation efforts, including management and direction of UH’s research support, technology transfer and many compliance functions. One of his priorities will be to support significant growth in research through the University of Hawaiʻi Innovation Initiative (HI²), which seeks to double the state’s research enterprise to $1 billion annually over the next decade. 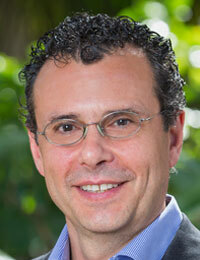 Syrmos has previously served as the associate vice chancellor for research at the University of Hawaiʻi at Mānoa. In that capacity, he has worked on a range of projects including developing major research facilities such as the Daniel K. Inouye Center for Microbial Oceanography: Research and Education (C-MORE Hale), the state’s only laboratory to be rated LEED Platinum. Since 1991, he has been with the department of electrical engineering at UH Mānoa, where he is a professor. He has also served as the associate dean of the College of Engineering. He spent a sabbatical leave at The Boeing Company as a research fellow. He is the author/coauthor of more than 100 journal and conference papers and the book Optimal Control, 2nd edition, John Wiley, 1995. He was an associate editor of Circuits, Systems and Signal Processing. He has served in numerous international conferences in technical program committees, editorial boards and organizing committees. His research has been funded by the National Science Foundation, the Defense Advanced Research Projects Agency, the Office of Naval Research, the Naval Air Systems Command, the Naval Sea Systems Command, the Air Force Research Labs at Wright Patterson, the Army Research Labs, The Boeing Company, Hawaiian Electric Company and Hamamatsu Photonics. Syrmos has been a consultant for the Canada France Hawaiʻi Telescope, Innovative Solutions, Science Technology International and others. He is a Boeing AD Welliver Fellow, a member of the Sigma Xi research organization, a senior member of the Institute of Electrical and Electronics Engineers and was a member of the board of the Hawaiʻi Technology Development Venture program. He is a board member of the Research Corporation of the University of Hawaiʻi (RCUH), the Pacific International Center of High Technology Research (PICHTR), Natural Energy Laboratory of Hawaiʻi Authority (NELHA), the Hawaiʻi Academy of Sciences and XLR8UH, the University of Hawaiʻi’s first proof of concept accelerator. Syrmos obtained his PhD at Georgia Institute of Technology in electrical engineering and a diploma in electrical engineering from Democritus University of Thrace, Greece.